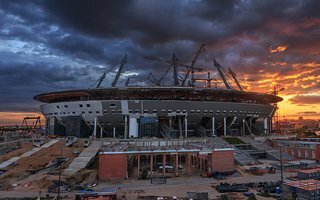 Assembly of Zenit Arena’s permanent roof is over. Or not over yet, but the main structure is now in place. Now steel cables are being installed between the roof and 8 inclined masts that are to hold it eventually. Until the cables reach optimum tension, temporary supports under the roof need to be retained. The roof will eventually look as in the above rendering, but it will take some 4 more months. Already now the 18,000-ton structure is one of the world’s heaviest, but still needs some work. The central part is not done until segments of future retractable roof are lifted. At present they rest where future football field will be. They now need to be mounted atop the permanent roof, on which they will slide to open/close the arena for events. Overall the roof structure should be delivered this autumn. Zenit Arena will not be ready in 2015, though. It’s expected to be opened in late 2016, which means construction will eventually last over 10 years!